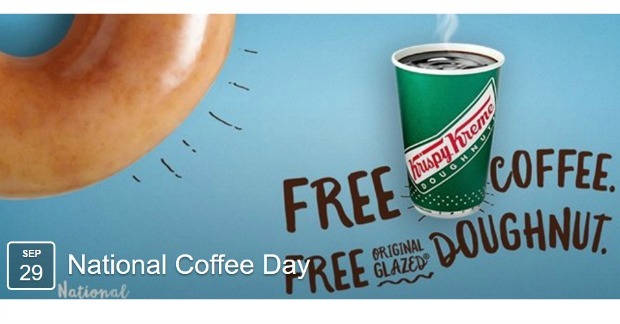 FREE Krispy Kreme Doughnut And Coffee! You are here: Home / FREEbies / FREE Krispy Kreme Doughnut And Coffee! You can get a FREE cup of coffee and a Doughnut at Krispy Kreme on 9/29/2016! The perfect pair is FREE on Sept. 29! Any guest who visits a participating shop on National Coffee Day will receive a FREE small coffee and a FREEOriginal Glazed® doughnut. The offer will be valid at participating shops from the beginning of regular business hours until close of business on September 29 only. Krispy Kreme’s signature drip coffee is rich and robust, with a freshness guests can taste. The pairing of Krispy Kreme coffee with an Original Glazed doughnut will add the perfect perk to those celebrating National Coffee Day across the US/CAN. No purchase is necessary for guests to take part in National Coffee Day. Be sure to share your favorite National Coffee Day moments using #KrispyKreme.